Glass beaded bracelet made with eco friendly commercially recycled sterling silver. Rainbow summer bracelet. Gorgeous, colourful, beaded bracelet. Glass beaded bracelet made with eco friendly commercially recycled sterling silver. Great sustainable fashion statement. This bracelet is 21cm (8″) long. It can be made to suit you. Made with all sterling silver and glass beads. The gorgeous clasp is a Karen Hill Tribe toggle clasp. All sterling silver wire used for Rings and Stones products is eco-friendly recycled sterling silver. I buy my sterling silver from an Australian supplier committed to best environmental practice using recycled materials. The sterling silver is exactly the same composition as mined silver but it has been recycled from scrap, unused, leftover sterling silver that is melted down, refined and then remade into sterling silver wire and sheet metal. Great for the environment. Sustainable fashion. All items come packaged ready to give as a gift. I don’t include a printed receipt. A receipt is emailed to you immediately after your order is completed. If you would like a printed receipt included please leave me a note at checkout. A vibrant, elegant and stylish original Murano glass bracelet. An original pattern and texture in sterling silver chainmaille make this delightful bracelet stand out. 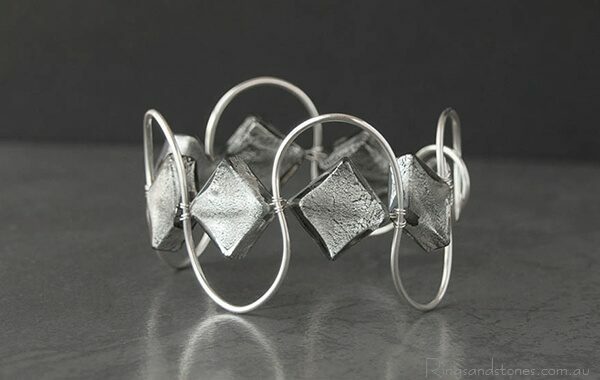 Finely handcrafted silver bracelet, a unique modern mix of patterns and textures. Summer garden fun, colourful beaded bracelets. Urban industrial style stunning but understated, gorgeous for him or her.